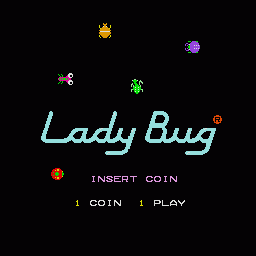 A definate pacman variant, with a twist, Ladybug sees you controlling a ladybird, munching the flowers and collecting the bonus letters and vegetables. You can move the green revolving doors through 90 degrees each time it pushes against it, thereby changing the layout of the maze and blocking off the path of the pursuing bugs. Simply clear all the flowers, hearts and letters to advance to the next level. However it's not all smelling of roses in the garden - wouldn't that be just nice and cosy? :) You have four enemies to avoid on each screen which take the form of one of nine different varieties of insects, from purple beetles to green centipedes. On the first nine stages there are always four of the same type of bug, but after stage nine they start to mix and match so you get four different varieties on each stage. Each has it's own characteristic, and some are faster and smarter than others. The bugs live in a base in the centre of the screen - like Pacman - and cannot kill you until they are mobile. The green moving bar round the outer edge of the maze tells you when a bug is about to leave the base. On every stage it will leave the base when the bar has done a complete circuit, but on each level the bar moves progressively faster. You should use this as a an important guide, especially for when to collect a bonus vegetable and a bug is heading for a skull. The moving bar round the outer edge of the maze denotes when the letters will change colour. For example on level one the red letters appears each time the bar reaches the 3/4 mark and on level three just after one complete revolution. The bar moves faster on each later level. On level five it takes two cycles of the bar for the letters to turn red, so in this time two biugs are moving around. Learn these patterns of when the letters will change; this is the key to scoring extra valuable points. At the start of each screen you are briefly shown which letters which be available on the coming stage. Collect the hearts when blue to increase the score multiplier to x2, x3 and x5, and collect the EXTRA letters when yellow for an extra life, and the SPECIAL letters when red to win a free credit. Avoid the skulls in the maze, and lure the bugs into them to kill them. When all four bugs are away from their base, a bonus vegetable appears which when collected freezes the bugs for a short period of time, giving you temporary respite. This will reappear if you then kill a bug with a skull and it then leaves the base again. The starting maze layout remains unchanged from level to level, but the difficulty increases by speeding up the bugs, although your ladybug never gets to move any faster. On later levels, the pursuing bugs also speed up dramatically if you take too long to clear the screen. Scoring Eating a flower: 10 points x score multiplier value. Collecting a heart - 100 points x score multiplier value. Collecting a yellow letter - 300 points x score multiplier value. Collecting a red letter - 800 points x score multiplier value. up to a maximum value of 9,500 for the horseradish on level 18 onwards. Use the swing doors to block off the bugs' pursuit. Quickly flip a door as you pass it when a bug is behind you and as long as the bug is not too close, its route will be blocked and it will then have to find an alternative route to you. If the bug is too close it will go through the door behind you and there may be no escape. Try to collect bonus vegetables when there are still skulls available on the maze. If another bug dies, when it leaves the base another vegetable will appear. 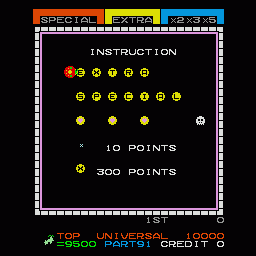 This is the key to high scores on later levels when the vegetables are worth anything up to 9,500 points each. Get the score multiplier up to x5 as soon as possible. 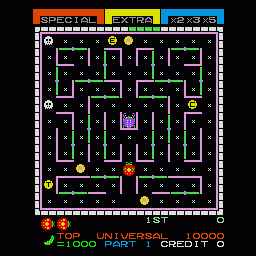 All points on the maze except bonus vegetables will then be multiplied by 5. You should get the hearts before getting ANY letters. The exception is when one of the letters is only 2 spaces above the enemy bugs' base, and waiting for it to turn red may prove fatal. Alternatively you can try to collect a letter in this position when the bugs are frozen, when you have a few seconds to wait around for it to change. Collect all unneeded letters when they are red with the multiplier on x5 for 4,000 points each. For example if you already have the "X" for EXTRA collect it again when it is on red x5. Clear the flowers around the bugs' base at the start of each level from stage 5 onwards. This is especially important past stage 10 when the bugs speeds is much increased. You do not move any faster, and will need to have a good knowledge of the maze layout to avoid them. Use the swing doors to force the bugs to go where you want them to. Example: stay to the upper right of the bugs' base, and let them come to you. When they are close, move the door so they have to pass your position, and when they are past you move the door again, so that they have to go the long way round to get to you again. Wait until all four bugs are out and then you can get the bonus vegetable when the way is clear. Watch out though, as some breeds of bug are particularly studid (or smart) and will not follow the route you want, but will lurk near you to try and trap you. Try to group all 4 bugs close together to increase your chances of getting the bonus vegetable. If you quickly flip the same revolving door several times in succession you will notice you move part way through it. You can now walk through this door without spinning it. Useful if you want to wait somewhere and make a getaway without moving the door.